"We'd gone out for drinks and noticed footsteps in the snow around the sculpture but didn't think anything about it," Clark said. Sometime before 2 a.m., the work was gone. The good news? 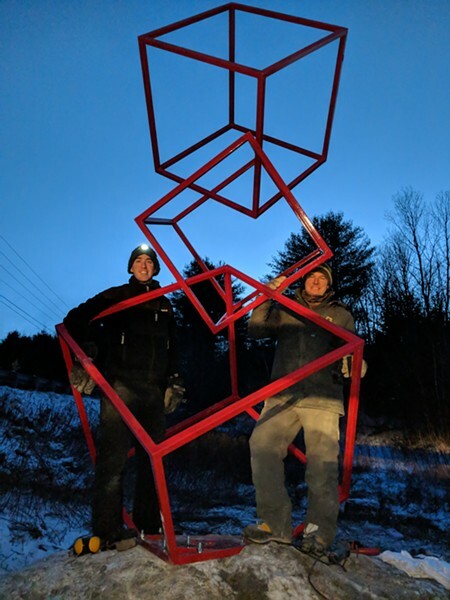 As of this morning, the sculpture has been found and has been moved back to the studio, SLAG Sculptures, where Clark and Lefrançois create their custom works. The bad news is that the piece is severely damaged as a result of being crudely wrested from its base, and from being dumped in a ditch. If the thieves had some grander plan for the artwork, it was quickly abandoned — no more than 500 yards away. Police investigating the crime have discovered tire tracks where the thieves' truck turned around in a nearby drive. It's likely just a matter of time until their identities will be discovered, too. "Now we know it was someone local," said Clark. "It's hard to keep a secret in small towns." He speculated that it was "probably a younger person who didn't have a thought, or respect for all the work it took to make this." 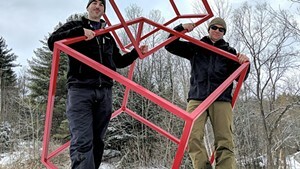 When he and Lefrançois installed their sculpture, it was a sub-freezing day, Clark noted. Temperatures have plummeted further since then. Nevertheless, the artists aim to fix and re-install the work. "We were trying to decide, do we wait until spring, or get it out there like a middle finger to the [thieves]?" Given the local support and encouragement," he added, "I fully expect we'll try to get it out there as soon as possible." 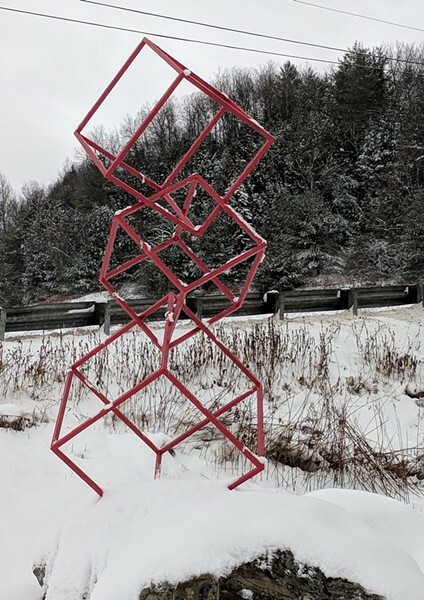 Does the sculpture have a name? "No — we keep getting asked that," said Clark with a chuckle. "We were joking last night that it's the 'whales' tails' of Richmond" (referring to the Jim Sardonis sculpture, actually titled "Reverence," alongside I-89). "We considered 'Smiles on Faces,' based on one of our favorite reggae songs," he continued. "We'll see what the local people decide to call it." The stolen and found sculpture was "kind of a calling card for us," Clark said, "but it's become a saga."